Vasseur A, Obadia M, Chardain A, Garcia PY, Giannesini C, Stankoff B. Encéphalomyélite aiguë disséminée et primo-infection par le virus d’Epstein Barr. Revue Neurologique 2013;169:A40. Tadmori I, Chaouki S, Abourazzak S, Zahra SF, Benmiloud S, Idrissi ML, et al. L’encéphalomyélite aiguë disséminée chez l’enfant. Pan Afr Med J<7em> 2014;19:280. Baum PA, Barkovich AJ, Koch TK, Berg BO. Deep gray matter involvement in children with acute disseminated encephalomyelitis. Am J Neuroradiol 1994;15:1275–1283. Sonneville R, Demeret S, Klein I, Bouadma L, Mourvillier B, Audibert J, et al. Acute disseminated encephalomyelitis in the intensive care unit: clinical features and outcome of 20 adults. Intensive Care Med 2008;34:528–532. 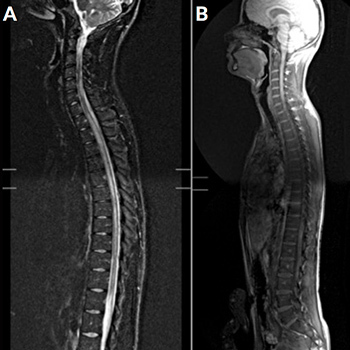 Ohtake T, Hirai S. Recurrence of acute disseminated encephalomyelitis after a 12-year symptom free interval. Intern Med 2004;43:746–749. Glaser CA, Honarmand S, Anderson LJ, Schnurr DP, Forghani B, Cossen CK, et al. Beyond viruses: clinical profiles and etiologies associated with encephalitis. Clin Infect Dis 2006;43:1565–1577. Tenembaum S, Chitnis T, Ness J, Hahn JS. Acute disseminated encephalomyelitis. Neurology 2007;68:S23–36. Menge T, Hemmer B, Nessler S, Wiendl H, Neuhaus O, Hartung H, et al. Acute disseminated encephalomyelitis: an update. Arch Neurol 2005;62:1673–1680. Dale R. Acute disseminated encephalomyelitis. Semin Pediatr Infect Dis 2003;14:90–95. Garg R. Acute disseminated encephalomyelitis. Postgrad Med J 2003;79:11–17. Schwarz S, Mohr A, Knauth M, Wildemann B, Storch-Hagenlocher B. Acute disseminated encephalomyelitis: a follow-up study of 40 adult patients. Neurology 2001;56:1313–1318.